There was a minor engine room fire aboard Royal Caribbean's Allure of the Seas last night (April 20, 2012). Allure of the Seas is one of the two largest cruise ships in the world. The incident occurred at approximately 7:45pm as the ship was sailing from St. Maarten to Ft. Lauderdale. The blaze was quickly contained and extinguished by the ship's high fog system. Overall, the incident lasted about 15 minutes. Passengers were alerted via an announcement, but were not mustered. A passenger reported the ship changing course to prevent the wind from blowing smoke from the fire over the ship, but Royal Caribbean is not confirming that. Neither propulsion nor hotel services were affected by the fire, and the ship is continuing on its way to Ft. Lauderdale where it will arrive as scheduled Sunday morning. No repairs will be necessary. Costa Crociere said this morning they have chosen the plan submitted by the partnership between Titan Salvage and Micoperi to remove the wreckage of Costa Concordia from the island of Giglio. Titan Salvage is an American-owned specialist marine salvage and wreck removal, and Italian-owned Micoperi is a specialist in underwater construction and engineering. The Titan/Micoperi plan was chosen from among six submitted. It will refloat Costa Concordia in one piece and tow it to an Italian port and then deal with it in accordance with the requirements the Italian authorities will set forth. Part of the plan deals not only with safeguarding and restoring the environment, but also minimizing the impact on Giglio's economy during their peak summer tourism season, as well as doing the work as safely as possible. Fuel removal from the ship was completed on March 24, and caretaking operations are underway and will continue until the Titan/Micoperi work begins. Those include removing from the seabed the debris caused by the incident. The work by Titan/Micoperi is expected to begin in early May after final approval is received from the Italian authorities. More information on the process will be available at that time. The removal is expected to take approximately one year from the time work begins. Get ready to cruise back through time to 1962, and enjoy this amateur color video of SS France's maiden arrival in New York. Of course a few short years later she was laid up and then became SS Norway sailing for Norwegian Cruise Line. And now she's gone. Power and propulsion system manufacturer ABB said they will provide complete power systems and Azipod propulsion systems for both Royal Caribbean Project Sunshine ships, which will be delivered by Meyer Werft in 2014 and 2015. In this promotional video supplied by ABB, various models of the podded propulsion system can be seen, and you not only see the systems from the outside but also the inside as a technician climbs into one of the pods from inside the ship, a capability which allows the Azipod to be serviced with the ship still in the water. Details of this story appeared in the April 18, 2011 edition of Cruise News Daily. Passengers aboard Ruby Princess last week had the opportunity to see the best of the best. All five finalists for the title of Princess Cruises' Entertainer of the Year were aboard the week-long cruise performing. They were Bert Stratton, The Beatlemaniacs, Steve Moris, Carlos Oscar and David Cats. On Saturday the passengers voted and chose the best of the best of the best, as you'll see in this video when the winner is revealed. 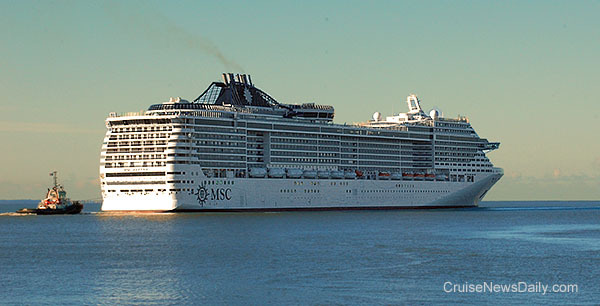 STX France reports that MSC Divina has completed her initial sea trials and returned to the STX yard at Saint-Nazaire (France). During the three-day trial, more than 60 separate tests were performed covering everything from speed and manageability to sound levels and vibration. Further testing will continue up until the handover on May 19. The ship will then immediately leave on its 7-day maiden cruise to Marseille where it will be christened by Sophia Loren on May 26.